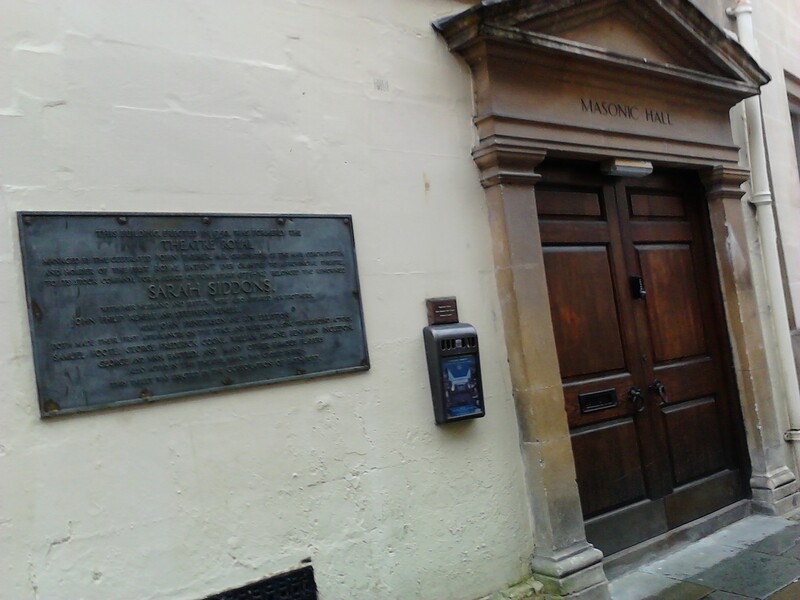 I discovered a real gem to add to my blogs on Bath yesterday – the old Royal Theatre, Orchard Street, Bath – Jane Austen was certainly a visitor there. When I met a friend for coffee in Bath yesterday I happened to spot a leaflet on the Orchard Street Theatre which is still open for guided tours. I was wonderfully surprised. I have lived near and visited Bath for thirty years and never heard of it before. I knew there had been a previous theatre to the one in use now, which I have been to several times, but I thought it had been destroyed long ago. I have even tried previously to find out where it was. So what a brilliant thing to find it still existed and be able look around it and find out all about its history. I spoke in my blog on The history of life in 18th Century Bath about Queen Anne’s visit to Bath in 1703 to take the waters for her health. 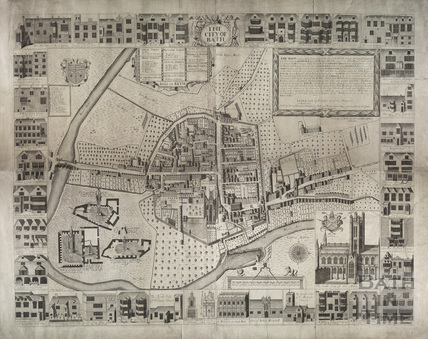 There is an old map of Bath by Gilmore from 1694 which shows Bath before the Georgian redevelopment. It must have looked still much like this when Queen Anne visited and the city experienced its embarrassing lack of entertainments. There was a theatre at the time but it was in a stable by the upper borough walls, where the Mineral Water Hospital stands now, the current hospital for Rheumatic Diseases. Opposite this hospital is the only standing section of the medieval wall. The Queen had brought with her, in her entourage, the entire Drury Lane Theatre Company and they must have been sorely disgusted by the adapted stable for a stage. 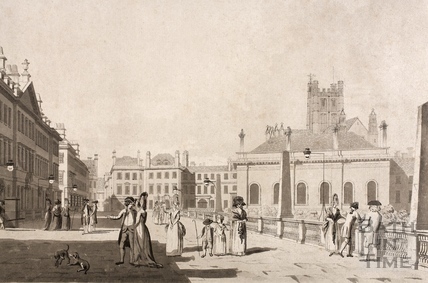 After Queen Anne had left, Bath was embarrassed enough for its wealthy occupants to raise the funds to build a theatre on this spot.But even so it was poor in comparison to its London counterparts and therefore attracted only equally poor travelling players. As well as this Theatre of course, as I have mentioned in my blog on the Assembly Rooms in Bath ,after Queen Anne’s visit the assembly rooms began to be established to provide entertainment for visitors to Bath and in general Bath was a growing improving and developing city. It was at this point Beau Nash who I have been blogging about for the last few weeks began his reign. Of course the assembly rooms recognised the inadequacy of the Theatre and took advantage establishing unofficial stage plays as part of their entertainments and one of these, the Harrison’s Rooms, had by the late 1730’s built a theatre to seat 200 in its basement. The Harrison’s Rooms, later known as the “Lower Rooms”, in comparison to the “Upper Rooms” which are still open, used to stand in the position of what is now the island in the middle of the traffic area where the tourist buses depart from. However this basement Theatre was still no comparison to the London Theatres but its rivals, including the old stable, were closed in 1736, when an Act of Parliament was made to close unlicensed playhouses. It was finally in 1747 that Bath was challenged to do better. Bath responded to the challenge and raised the funds for a brand new, purpose built theatre to be positioned outside of the old medieval walls near the South Gate. Nine investors contributed fifty pounds. Beau Nash, and John Wood the elder, who I have also mentioned in previous blogs on Prior Park and its Grotto and Graffiti, were included in the investors along with Hippisley and other actors. 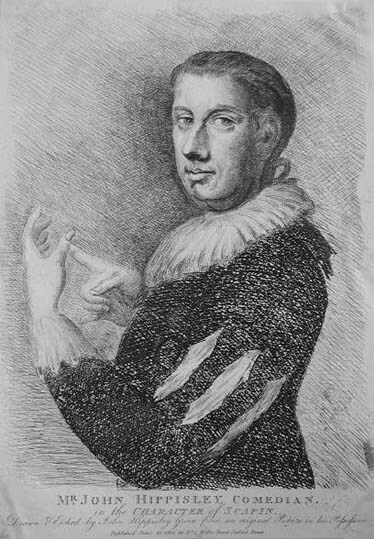 He increased the share holders to twenty and the Orchard Street Theatre opened on the 27th October, 1750, to a prologue spoken by a good friend of John Hippisley, Mr Watts. Of course the New Theatre was now in direct competition with the old one in the Lower Assembly rooms and they competed quite hotly with many arguments as they fought for actors and staff over a period of five years, but then Beau Nash in his way of orchestrating Bath for his own profit stepped in and informed the Lower Assembly rooms that their theatre, which he had no investment in, must close. In my next blog I’ll tell you more about the new theatre and share some more pictures, stories and facts, both about the building itself, life within the theatre and those who visited it. There is still loads to tell, including details of Jane Austen’s connection, too much for one blog probably. Posted on July 15, 2012 by janelark •	This entry was posted in Georgian Stories, Jane Austen, Stories from the City of Bath, Stories of Kings and Queens and tagged 1700s, 18th Century, Bath, Beau Nash, Jane Austen, Jane Lark, Pride and Prejudice, regency books, Theatre, writing. Bookmark the permalink.